Showing items in category South Africa, sorted by newest listed first. SOUTH AFRICA - 1946 1/2d 'bantam' cover with 'THIS IS IMPORTANT' label applied. 1946 (9.II.) cover addressed to USA bearing 1/2d green 'bantam' with red on white THIS IS IMPORTANT label tied by JOHANNESBURG/D roller strike. SOUTH AFRICA - 1925 3d rate cover to USA used at IZINGOLWENI/NATAL. 1925 (AU.11.) cover addressed to USA bearing 1d and 2d 'head' adhesives tied by IZINGOLWENI/NATAL cds. SOUTH AFRICA - 1921 6d blue RPSE uprated to Germany used at MOORLEIGH. H&G 5a. 1921 6d blue on cream registered postal stationery envelope (size G) addressed to Germany and bearing additional 1d adhesive tied MOORLEIGH/S.AFRICA and dated 24.OCT.27. H&G 5a. SOUTH AFRICA - 1913 1/2d rate postcard use to Cape used at ROSMEAD. 1913 (DEC.30.) 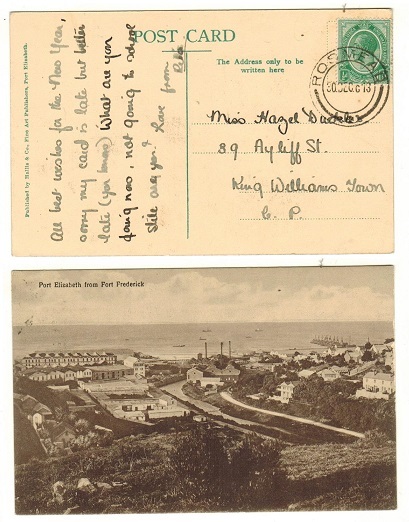 use of picture postcard addressed to Cape depicting 'Port Elizabeth from Fort Frederick' bearing 1/2d 'head' adhesive tied ROSMEAD. SOUTH AFRICA - 1926 1d rate local cover used at EIKENHOF. 1926 (FEB.19.) 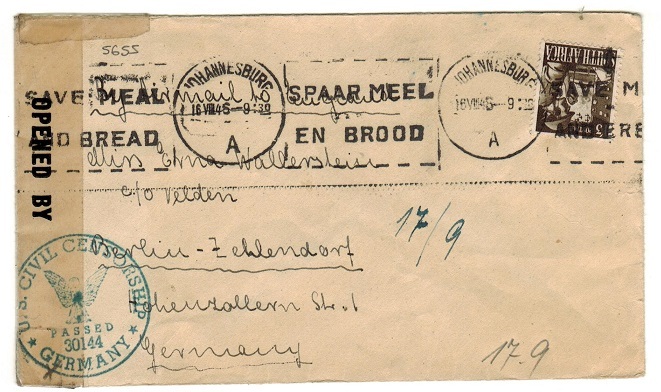 cover addressed locally to Pretoria bearing 1d 'head' tied by d/r EIKENHOF cds. 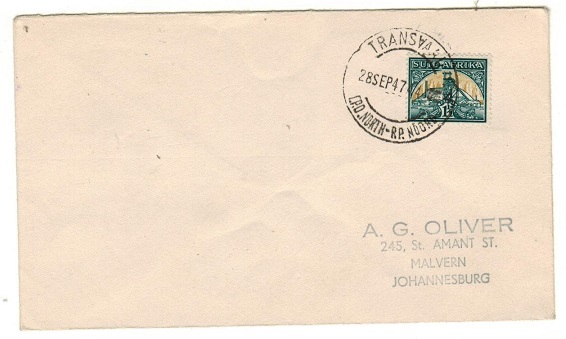 SOUTH AFRICA - 1947 1 1/2d rate 'TRANSVAAL/T.P.O.NORTH' cover to Johannesburg. 1947 (SEP.28.) cover addressed locally bearing 1 1/2d single adhesive tied by TRANSVAAL/TPO NORTH cds. SOUTH AFRICA - 1954 6d+1d UNION OF SOUTH AFRICA POSTAL ORDER issued at LAMBERTS BAY. 1954 (23.VII.) issued 6d+1d green on cream UNION OF SOUTH AFRICA/POSTAL ORDER issued at LAMBERTS BAY and bearing additional 4d adhesive. Uncashed. 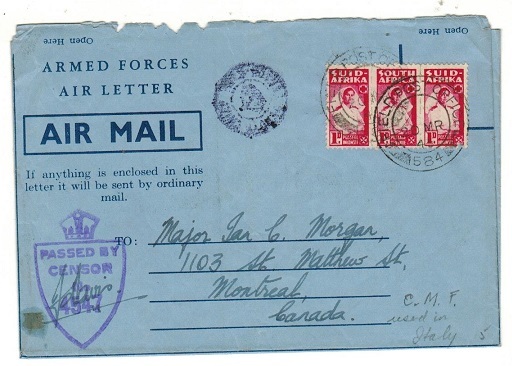 SOUTH AFRICA - 1945 3d rate use of ARMED FORCES AIR LETTER censored to Canada at FPO/584. 1945 (MR.20.) 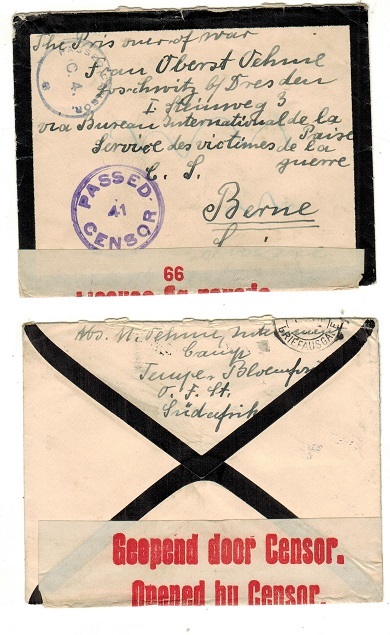 use of dark blue on blue ARMED FORCES/AIR LETTER addressed to Canada bearing 1d 'bantam' strip of three tied FIELD POST OFFICE/584 (used in Italy) and struck by violet crowned shield type PASSED BY/CENSOR/No./4547 h/s at lower left. 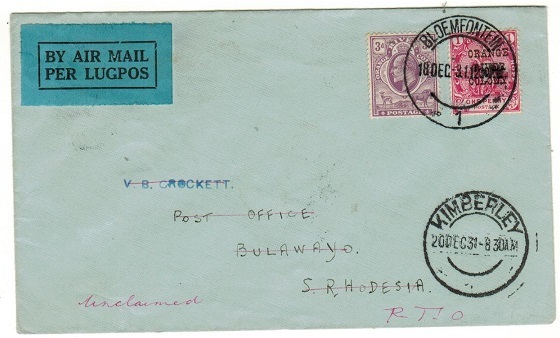 SOUTH AFRICA - 1931 cover to Bulawayo bearing 'ORC' 1d and 6d tied BLOEMFONTEIN. 1931 (DEC.18.) 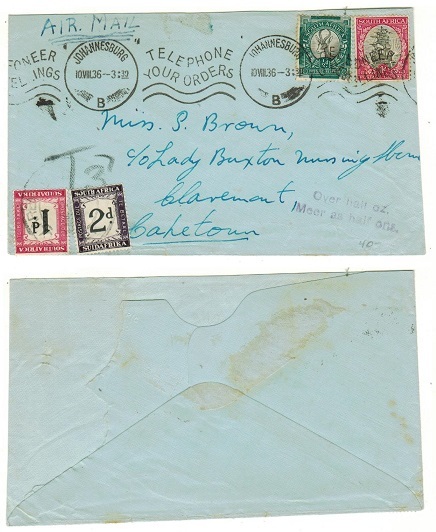 cover addressed to Bulawayo bearing Orange River Colony 3d tied with 1d 'Cape overprinted 'ORC' by BLOEMFONTEIN/1 cds. Unclaimed and returned. SOUTH AFRICA - 1950 6d green and bright orange 'Postage Due' mint pair with CENTRE SHIFT. 1950-58 6d green and bright orange 'roto printed' postage due pair in fine lightly mounted mint condition showing the variety CENTRE VALUE SHIFTED UPWARDS. SG D43. 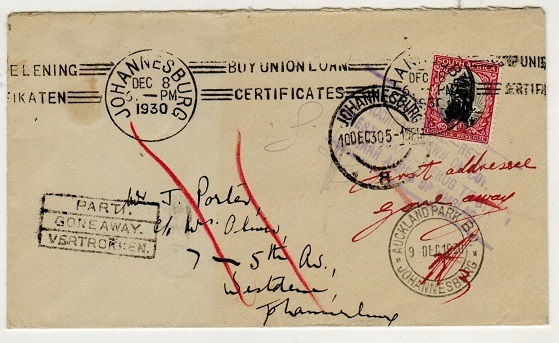 SOUTH AFRICA - 1936 underpaid cover (faults) with 1d and 2d 'Postage Dues' added. 1936 (10.VIII.) 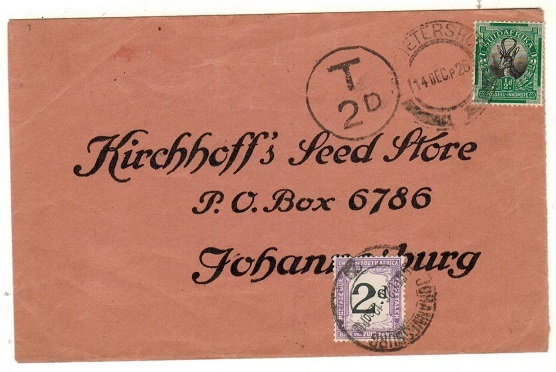 cover addressed locally to Cape Town bearing 1/2d 'spingbok' and 1d 'ship' adhesives tied by JOHANNESBURG/TELEPHONE/YOUR ORDERS slogan strike with scarce violet two lined OVER HALF OZ./MEER AS HALF ONS. instructional h/s applied with 1d and 2d 'Postage Dues' added. The cover unfortunately ripped open on reverse with flap and left edge missing. 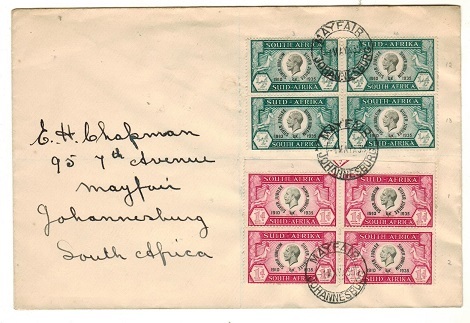 SOUTH AFRICA - 1926 unpaid cover with 2d 'Postage Due' added. 1926 (OCT.28.) 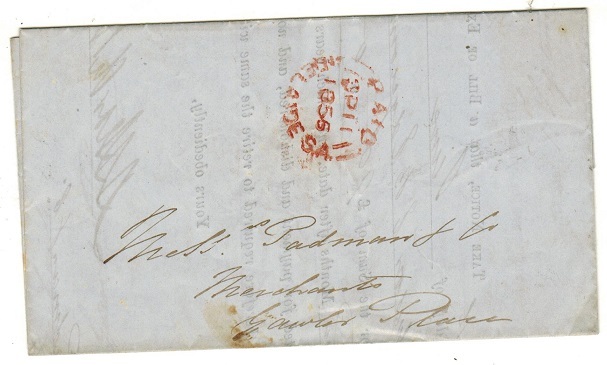 stampless cover addressed to Cape Town cancelled by CATHCART cds with large black '2d' tax mark at left with 2d 'Postage Due' added and cancelled by RONDEBOSCH cds dated 1.NO.26. SOUTH AFRICA - 1922 unpaid commercial card with 1d 'Postage Due' added. 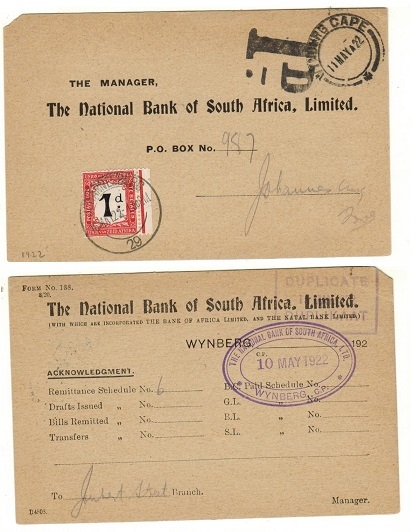 1922 use of pre-printed 'The National Bank of South Africa Limited' commercial card addressed locally & cancelled WINDBERG CAPE & dated 11.MAY.22. Being stampless the card received a large '1d' tax mark & has 1d POSTAGE DUE added (SG D2) & cancelled JOHANNESBURG/29 cds. 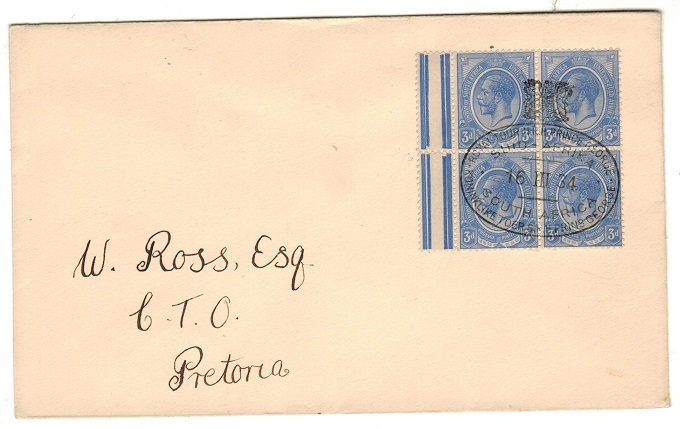 SOUTH AFRICA - 1922 inward underpaid postcard with 1 1/2d 'Postage Due' added. 1922 inward picture postcard from UK but being under-paid handstamped with black circular 'T/1 1/2d' tax mark and with 1 1/2d 'Postage Due' (SG D10) added and cancelled PRETORIA. SOUTH AFRICA - 1917 (tatty/faults) underpaid cover with Transvaal 1/2d dues used at MAITLAND. 1917 (FEB.17.) 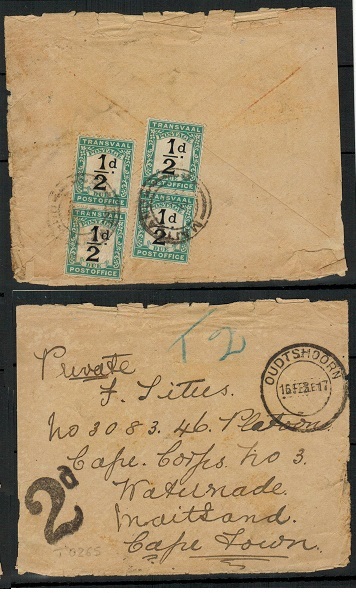 underpaid military cover addressed to the Cape Corps at Maitland cancelled by OUDTSHOORN cds (tatty edges/opened on 3 sides) and struck at left by scarce '2d' charge mark in black and with two pairs of the 1/2d black and blue-green Transvaal 'Postage Dues' applied to reverse side (SG D1) tied MAITLAND. Unusual use of these dues within the Cape. 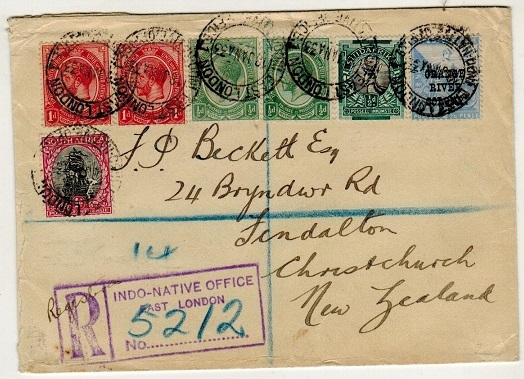 SOUTH AFRICA - 1933 'EAST LONDON/INDO NATIVE OFFICE' registered cover to New Zealand. 1933 (JAN.13.) 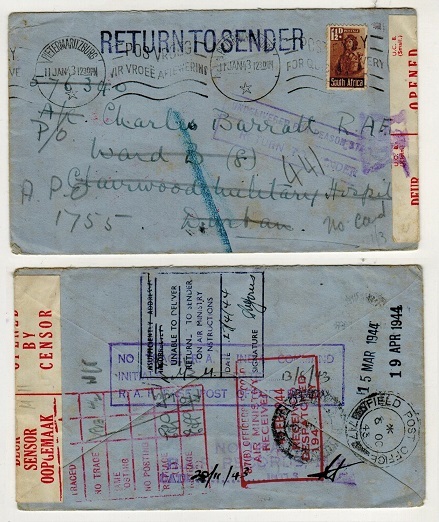 registered cover addressed to New Zealand bearing 1/2d (x2) and 1d (x2) 'head' adhesives with 1/2d 'Springbok' and 1d 'Ship' tied alongside Orange River Colony 2 1/2d tied by scarce EAST LONDON/INDO-NATIVE OFFICE cds with scarce violet 'R' registered h/s at lower left. 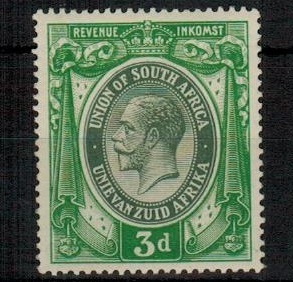 SOUTH AFRICA - 1913 3d green and dark green REVENUE fine mint. 1913 3d green and dark green REVENUE adhesive in fine mint condition with overall light toned gum. Barefoot and Hall 1. 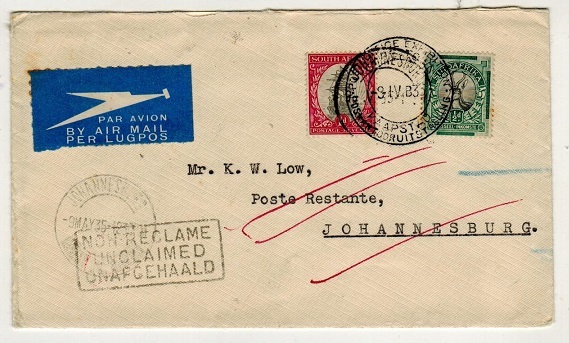 MAURITIUS - 1952 first flight cover to South Africa. 1952 (SP.3.) 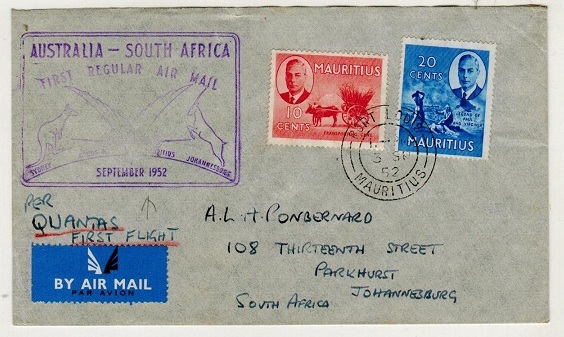 first flight cover addressed to South Africa bearing 10c and 20c adhesives tied PORT LOUIS/MAURITIUS and handstamped by violet boxed AUSTRALIA-SOUTH AFRICA/ FIRST REGULAR AIR MAIL cachet of Qantas Airways. SOUTH AFRICA - 1922 3d rate cover to USA used at WELLINGTON. 1922 (MAR.16.) 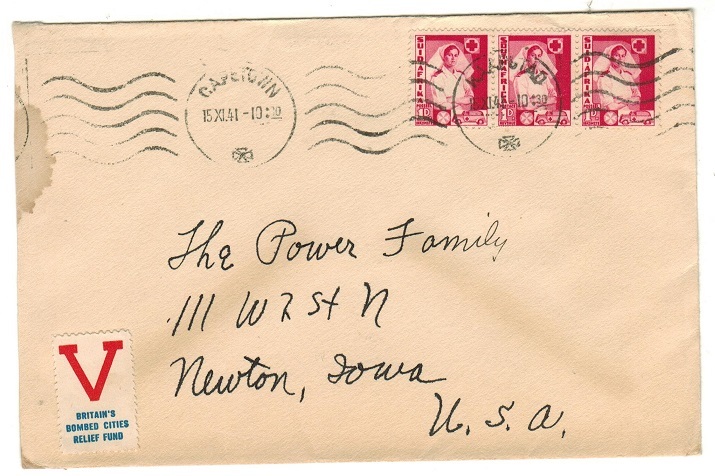 cover addressed to USA bearing 3d single tied by WELLINGTON/SOUTH/AFRICA cds with additional strike at lower left. SOUTH AFRICA - 1935 1d 'Silver Jubilee' local cover use from FORT BEAUFORT. 1935 (JUL.27.) cover addressed locally to East London bearing the 1d 'Silver Jubilee' (British) single adhesive tied FORT BEAUFORT. The cover was not delivered and struck by black three lined INCONNU/UNKNOWN/ONBEKEND handtsamp. RETURNED L.O./CAPETOWN b/s. SOUTH AFRICA - 1926 underpaid local cover with 2d 'Postage Due' added. 1926 (DEC.14.) underpaid cover addressed locally with 1/2d adhesive tied PIETERMARITZBURG and struck by circular 'T/2d' tax mark with 2d 'Posatge Due' added on arrival and cancelled JOHANNESBURG. 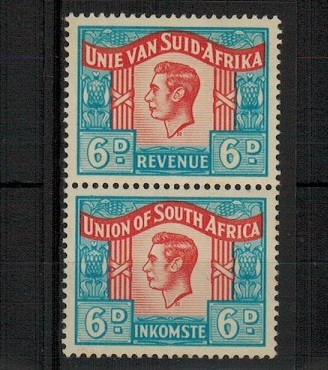 SOUTH AFRICA - 1935 inward under paid cover from UK with 6d (x2) 'Postage Dues' applied. 1935 inward underpaid cover from UK struck by black boxed MORE TO PAY/OVER….OZS bilingual instructional h/s with '1s/-' tax mark and with 6d green and bright orange 'Postage Due' pair affixed and cancelled CAPETOWN dated 6.JAN.35. SOUTH AFRICA - 1934 inward under paid cover from Iraq with 1d (x5) 'Postage Dues' added. 1934 (JAN.4.) 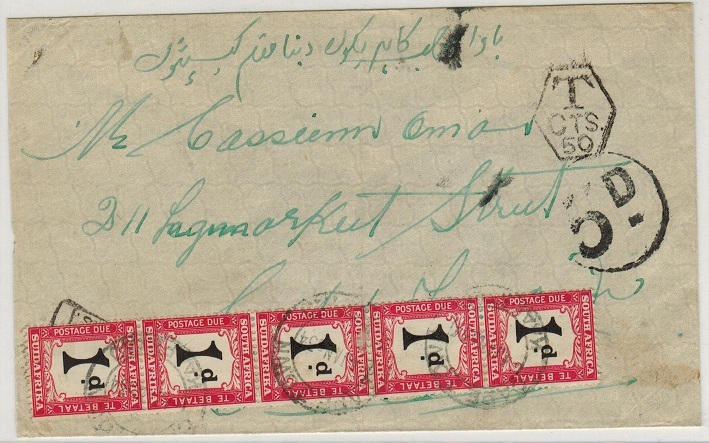 inward unstamped cover from Iraq (central fold) with horse shoe DUE/AS tax mark and sexagonal 'T/CTS/50' mark applied. On arrival struck by circular '5d' h/s with a fine strip of five of the 1d black and red 'Postage Due' applied and cancelled CAPETOWN. 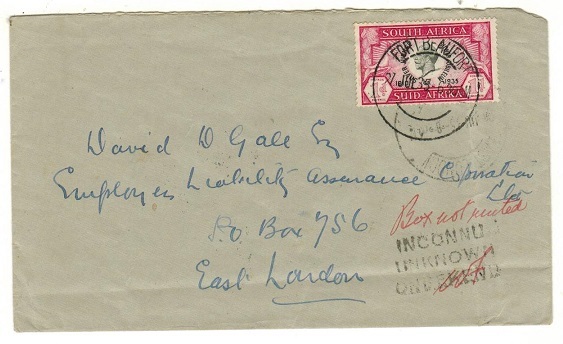 SOUTH AFRICA - 1931 inward underpaid cover from UK with 2d 'Postage Due' added. 1931 (JAN.21.) 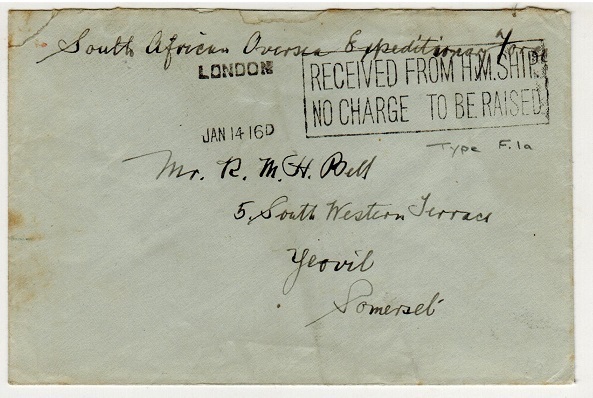 inward under paid cover addressed to Transvaal from the UK where on arrival a black circular 'T/2d' tax mark has been applied with 2d 'Postage Due' added alongside and cancelled VEOVILLE/JOHANNESBURG and dated 11.FEB.31. SOUTH AFRICA - 1914 2 1/2d rate censored cover to USA with CENSOR/CAPETOWN h/s applied on reverse. 1914 (NO.2.) 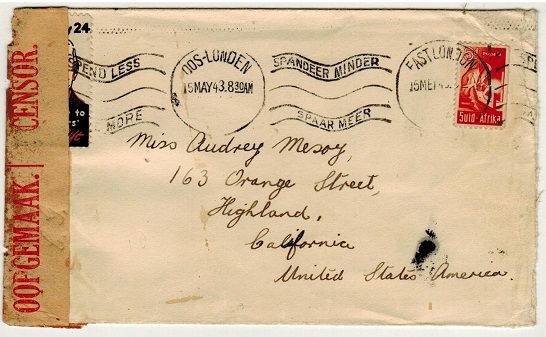 cover addressed to USA bearing 1/2d and 1d pair tied by ASHTON d/r cds's with red on cream OPENED BY CENSOR tape across the top and struck on the reverse side by scarce blue oval CENSOR/CAPETOWN handstamp dated 7.NOV.1914. 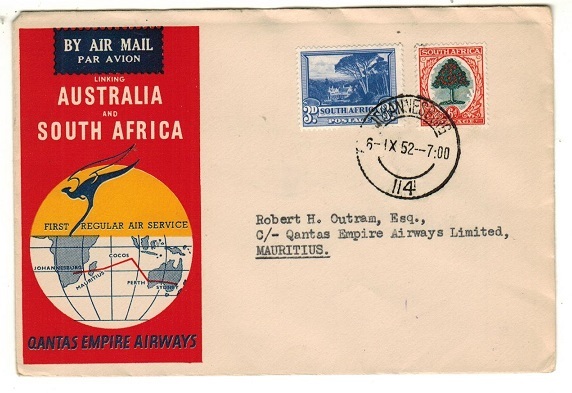 SOUTH AFRICA - 1952 'Qantas Empire Airways' first flight cover to Mauritius. 1952 (6.IX.) 'Qantas Empire Airways' illustrated first flight cover to Mauritius bearing 6d and 1/- adhesives tied JOHANNESBURG. 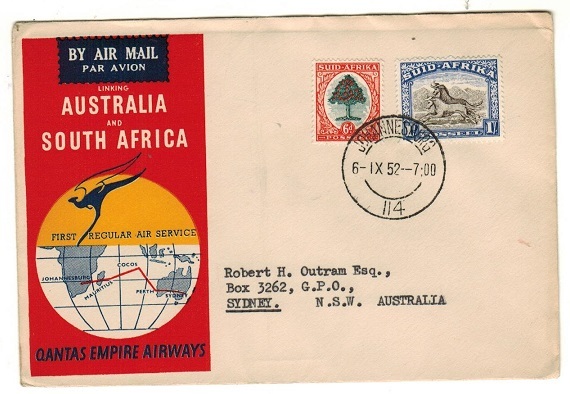 SOUTH AFRICA - 1952 'Qantas Empire Airways' first flight cover to Australia. 1952 (6.IX.) 'Qantas Empire Airways' illustrated first flight cover to Australia bearing 6d and 1/- adhesives tied JOHANNESBURG. 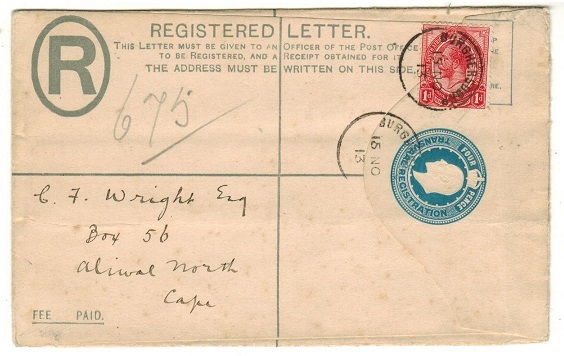 SOUTH WEST AFRICA - 1918 1/2d rate censored cover used at WALVIS BAY. 1918 (MAR.7.) 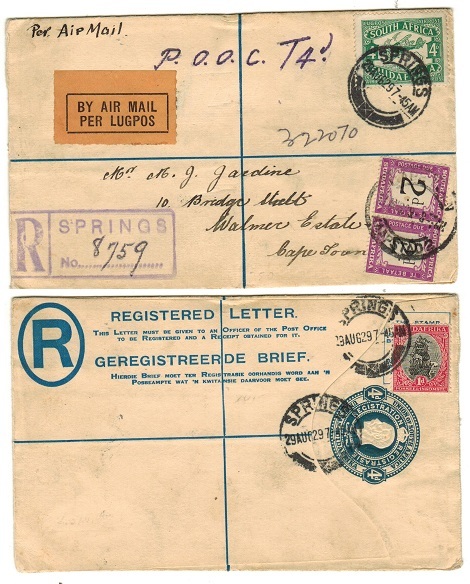 cover addressed locally struck by fine'Parry, Leon & HayHoe Ltd' commercial handstamp bearing South Africa 1/2d green adhesive tied WALVIS BAY/S.AFRICA and light PASSED BY CENSOR/ Z/16 h/s at lower left. 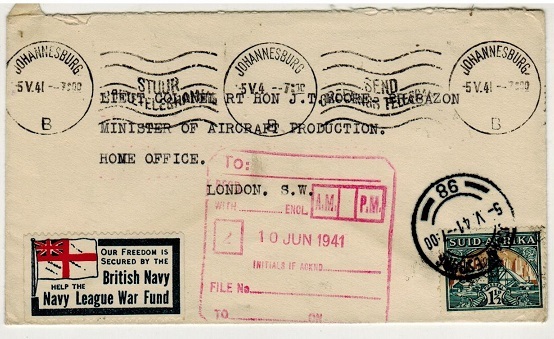 SOUTH AFRICA - 1943 6d 'POW FOOD PARCEL' label on cover to UK used at JOHANNESBURG. 1943 (25.X.) 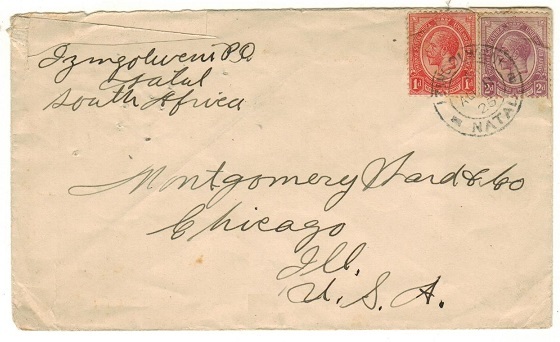 cover addressed to UK (central fold) bearing 2d 'bantam' tied by JOHANNESBURG/1 roller strike and bearing 6d P.O.W. FOOD PARCEL GIFT/TOBRUK label on reverse flap. SOUTH AFRICA - 1942 1d 'V GIFTS AND COMFORTS' patriotic label on cover to USA. 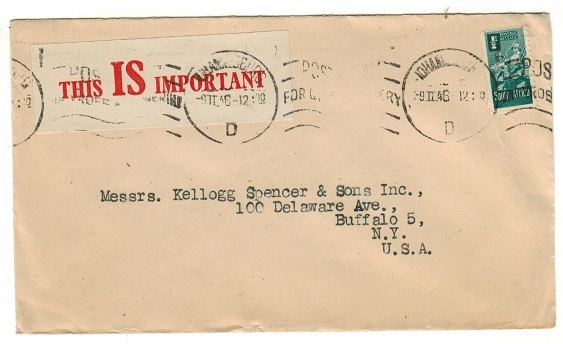 1942 (FEB.14) cover to USA bearing 3d adhesive tied in combination with green on white 1d/ THE SA/GIFTS & COMFORTS/V patriotic label by JOHANNESBURG/POST EARLY slogan strike. SOUTH AFRICA - 1943 4d 'RED CROSS' patriotic label cover to USA used at JOHANNESBURG. 1943 (MAY.14) cover to USA bearing 'Bantam' 1d+2d adhesives tied by JOHANNESBURG wavy lined cancel with red, white & blue patriotic 4d/PAYS ONE DAYS COMFORTS/FOR ONE CASUALTY Red Cross label on reverse flap. 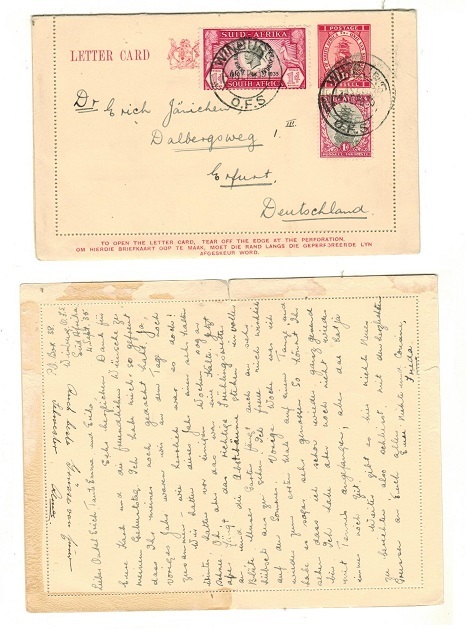 SOUTH AFRICA - 1933 1d carmine 'ship' letter card uprated to Germany at WINBURG. H&G 5. 1933 1d carmine on cream postal stationery letter card addressed to Germany (genuine use) bearing additional 1d ship adhesive and 1d 'Silver Jubilee' single tied WINBURG/OFS and dated 4.SEP.35. H&G 5. SOUTH AFRICA - 1939 3d rate cover to USA from Cape Town struck SURFACE CONVEYANCE. 1939 (19.VII.) 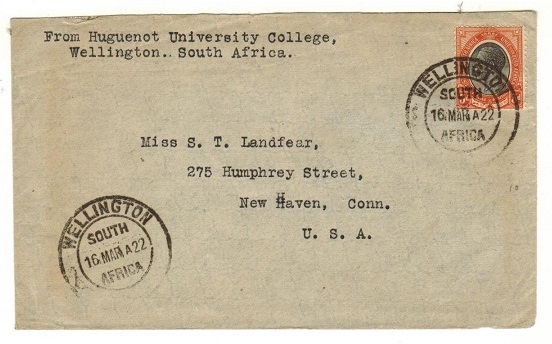 cover addressed to USA bearing 1/2d, 1d and 1 1/2d 'Huguenot' adhesives tied CAPE TOWN and struck at left by violet s/l SURFACE CONVEYANCE handstamp. 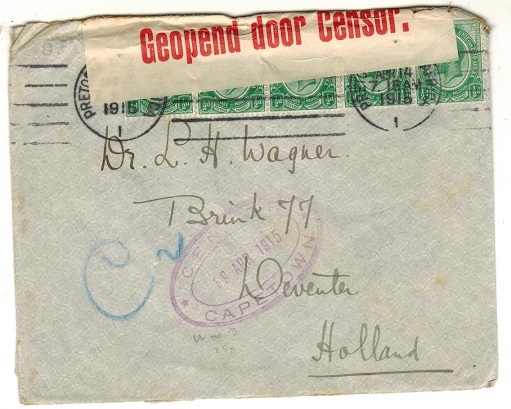 SOUTH AFRICA - 1915 2 1/2d rate 'CENSOR/CAPETOWN' cover to Holland. 1915 (APR.14.) 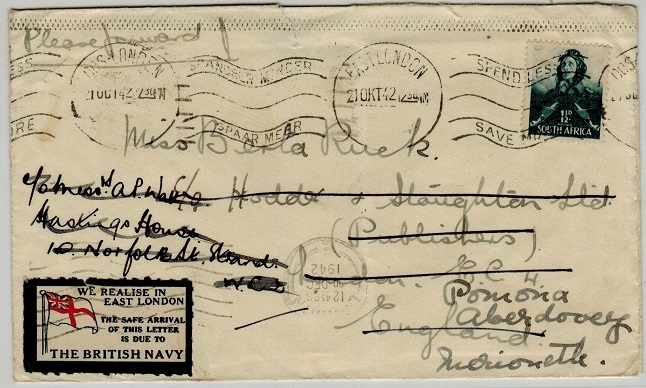 cover addressed to Holland bearing 1/2d sytrip of five making up the 2 1/2d rate tied by PRETORIA roller strike. The cover bears red on white OPENED BY CENSOR strip at top edge and is struck by scarce violet oval CENSOR/CAPETOWN handstamp. SOUTH AFRICA - 1939 use of TELEGRAM envelope complete with original telegram used at SCOTTBURGH. 1939 (OCT.30.) use 'J.D. & Co.' TELEGRAM envelope addressed locally complete with the original telegram form cancelled SCOTTBURGH. SOUTH AFRICA - 1930 1d rate 'GONE AWAY' local cover used at JOHANNESBURG. 1930 (DE.10.) cover addressed locally bearing 1d ship adhesive tied by JOHANNESBURG/ BUY UNION LONE CERTIFICATES slogan strike. Undelivered and struck by black PARTI/ GONE AWAY/VERTROKKEN strike with violet four lined billingual RETURN ADDRESSEE SHOWN ON COVER strike. 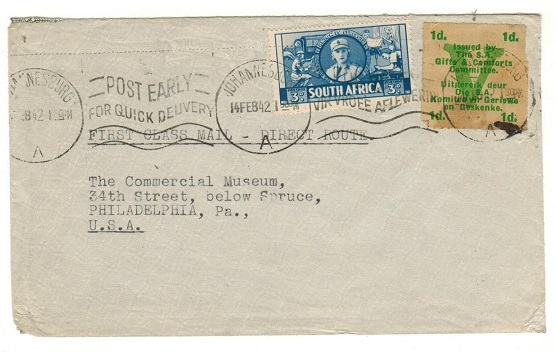 SOUTH AFRICA - 1932 'INSUFFICIENTLY PREPAID FOR AIRMAIL' cover to Canada used at PORT ELIZABETH. 1932 (JUN.2.) 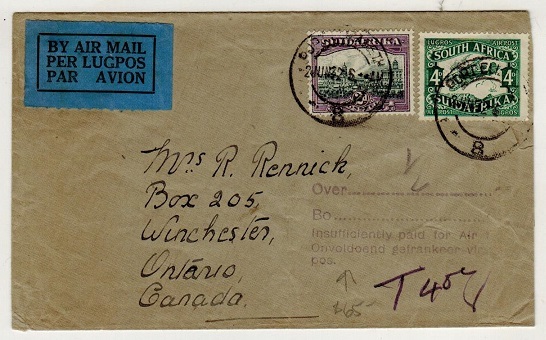 cover addressed to Canada bearing 2d and 4d adhesives tied PORT ELIZABETH and marked 'T/40c' in manuscript with scarcer violet five lined billingual 'OVER…..OZ/ INSUFFICIENTLY PAID FOR AIR MAIL' instructional strike. SOUTH AFRICA - 1934 'OVER HALF OZ' tax cover to UK. 1934 (NO.20.) cover addressed to UK bearing 6d adhesive with octagonal 'T/CENTIMES' strike alongside and scarce violet two lined OVER HALF OZ/MEER AS HALF ONS strike. SOUTH AFRICA - 1935 1/2d+1d 'Silver Jubilee' blocks of 4 on local cover used at MAYFAIR. 1935 (MY.1.) locally addressed cover bearing fine blocks of four of the 1/2d and 1d 'Silver Jubilee' (SG 65+66) tied by first day strikes of the MAYFAIR/JOHANNESBURG cds with one of the 1/2d values showing the ELONGATED 1 IN 1910 from Row 13/1. 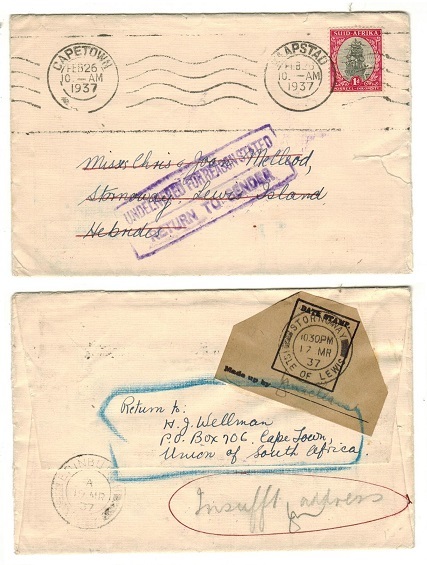 SOUTH AFRICA - 1935 'INSUFFICIENT PAID FOR AIR MAIL' cover to Egypt used at DURBAN. 1935 (APR.23.) 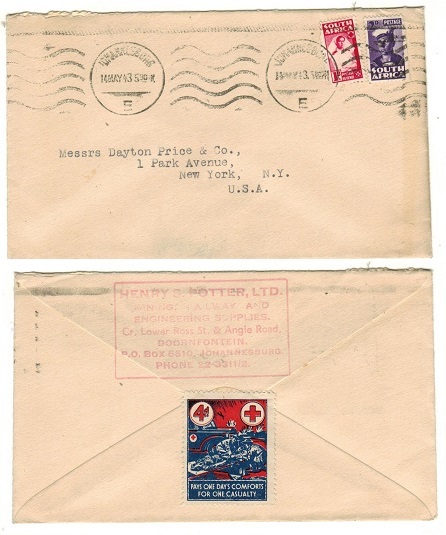 cover addressed to Port Said (roughly opened) bearing 3d and 6d single adhesives tied DURBAN and with violet five lined billingual OVER…..OZ/INSUFFICIENTLY PAID FOR AIR MAIL instructional h/s applied. SOUTH AFRICA - 1935 'UNCLAIMED' local cover. 1935 (9.IV.) cover addressed locally bearing 1/2d and 1d single adhesives tied by POST OFFICE EXHIBITION cds and with KOHANNESBURG arrival but struck by black boxed NON RECLAIME/ UNCLAIMED/ONAFGEHAALD h/s. SOUTH AFRICA - 1937 'RETURN TO SENDER' cover. 1937 (FE.26.) cover addressed to Lewis Island in the Hebrides (Scotland) bearing 1d 'ship' tied CAPE TOWN roller strike. The cover was not delivered and returned with South African UNDELIVERED FOR REASON STATED/RETURN TO SENDER h/s applied on arrival. SOUTH AFRICA - 1947 underpaid cover to UK with 'OVER 1/2oz/BO 1/2 Ons' handstamp applied. 1947 (JUL.15.) underpaid cover to UK bearing 3d and 6d single adhesives tied MEYERTON with octagonal 'T/CENTIMES' h/s at left and black boxed 'OVER 1/2oz/BO 1/2 Ons' billingual marking. SOUTH AFRICA - 1942 1 1/2d rate 'V/BOMBED CITIES/RELIEF FUND' patriotic label cover to UK. 1942 (27.II.) 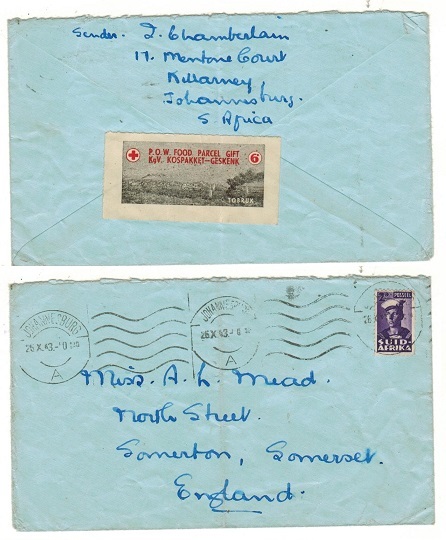 cover addressed to UK bearing 1 1/2d adhesive tied by CAPE TOWN/V roller strike with red and blue on white patriotic 'V/BRITAINS/BOMBED CITIES/RELIEF FUND label on reverse flap tied by inked bar from roller. SOUTH AFRICA - 1942 1 1/2d rate 'BECAUSE THEY SERVE' patriotic label cover to UK. 1942 (JAN.11.) 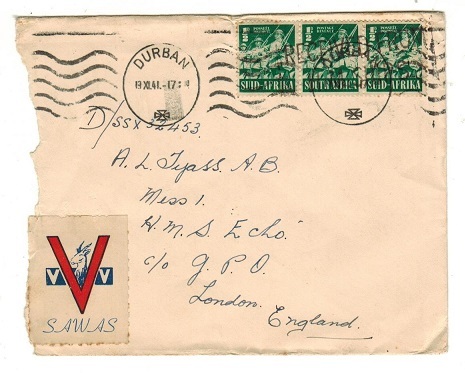 cover addressed to UK on pre-printed 'V' for victory envelope bearing 1/2d and 1d single adhesives tied by CAPETOWN/KAAPSTAD bilingual roller strike with an example of the perforated BECAUSE/THEY SERVE/WE LIVE/OMDAT HULLE DIEN BESTAAN ONS patriotic label at lower left. 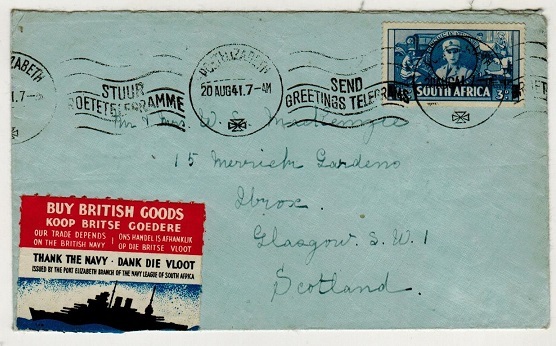 SOUTH AFRICA - 1941 3d rate 'THANK THE NAVY' patriotic label cover to UK. 1941 (AUG.20.) cover addressed to UK bearing 3d adhesive tied by PORT ELIZABETH bilingual SEND GREETINGS TELEGRAMS slogan strike with red, black and blue BUY BRITISH GOODS/ THANK THE NAVY bilingual rouletted patriotic label at lower left. SOUTH AFRICA - 1941 1 1/2d rate 'BRITISH NAVY LEAGUE' patriotic label fund cover to UK. 1941 (5.V.) cover addressed to UK bearing 1 1/2d adhesive tied JOHANNESBURG and with red, white and blue OUR FREEDON IS SECURED BY THE/BRITISH NAVY/HELP THE NAVY LEAGUE WAR FUND patriotic label at left with 'Union Jack'. 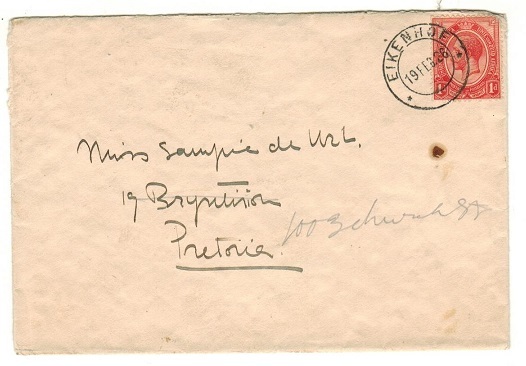 SOUTH AFRICA - 1946 inward underpaid cover from Argentina with 3d 'bantam' used as a postage due. 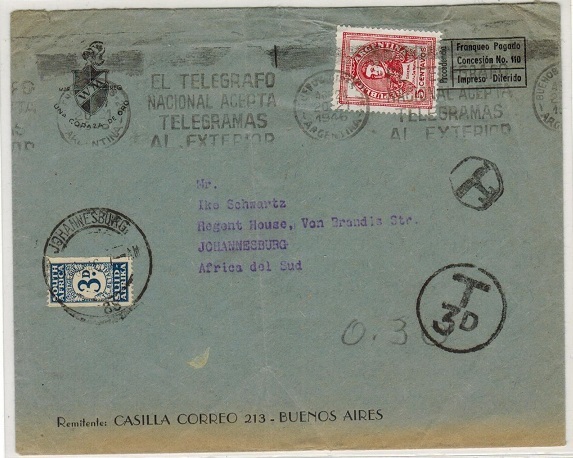 1946 inward underpaid cover from Argentina struck on arrival by circular 'T/3d' tax mark with 3d 'bantam' applied as a 'Postage Due' cancelled JOHANNESBURG/38. SOUTH AFRICA - 1944 inward under paid postcard from Kenya with 1d bantam added as 'Postage Due'. 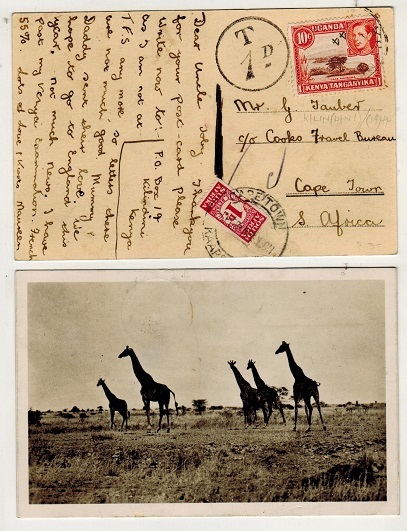 1944 inward underpaid postcard from Kenya with 1d 'bantam' applied as a 'Postage Due' and cancelled CAPETOWN. SOUTH AFRICA - 1d 'Silver Jubilee' rate postcard to Transvaal used at ROBERTS HEIGHTS. 1935 (JUN.7.) 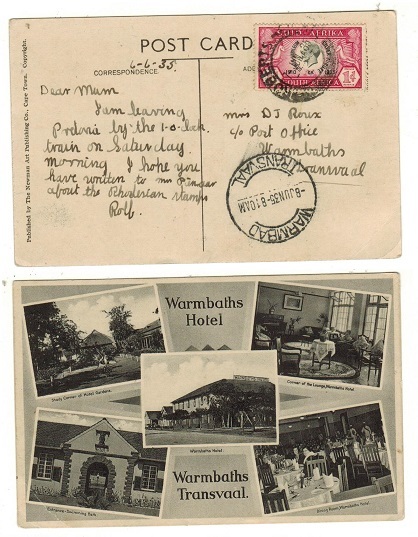 use of picture postcard addressed to Warmbaths in the Transvaal depicting various scenes of the Warmbaths Hotel bearing 'Suid Afrika' 1d 'Silver Jubilee' adhesive tied by ROBERTS HEIGHTS cds. 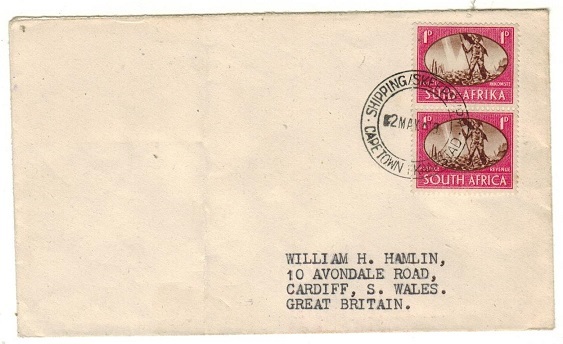 SOUTH AFRICA - 1949 'SHIPPING/CAPETOWN' maritime cover to UK. 1949 (MAY.2.) cover addressed to UK bearing 1d 'Victory' vertical pair tied by SHIPPING/SKEEPSVP/CAPETOWN cds. Light fold at left. SOUTH AFRICA - 1943 CONTRIBUTE TO GENERAL SMUTS labelled 6d rate censor cover to USA. 1943 (MAY.15.) 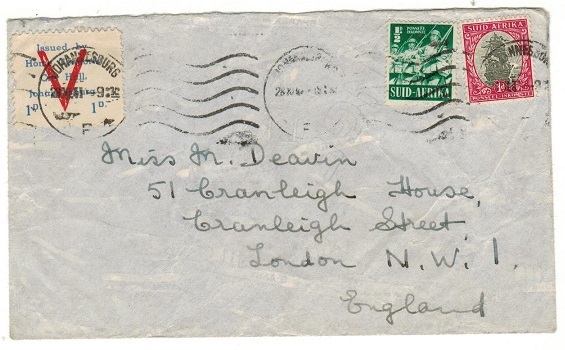 cover addressed to USA bearing 6d orange 'bantam' tied in combination with scarce 73 ON MAY 24/CONTRIBUTE TO/GENERAL SMUTS label at left by EAST LONDON/SPEND LESS slogan strike. The label is partly covered by a red on buff bilingual U.C.8/(small)/UNION OF SOUTH AFRICA/OPENED BY/CENSOR label. 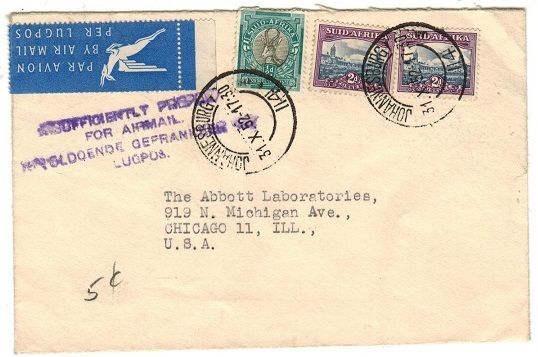 SOUTH AFRICA - 1943 FOR OUR ALLEY MEDICAL AID FOR RUSSIA labelled 3d rate censor cover to USA. 1943 (11.III.) cover addressed to USA bearing 1 1/2d brown 'bantam' pair tied in combination with red on white perforated 1d/FOR OUR ALLY/MEDICAL AID FOR RUSSIA patriotic label by JOHANNESBURG bilingual slogan strike. Red on cream SA 'U.C.8 (small)' OPENED/BY/CENSOR label at left tied on reverse by crested 'B' h/s in violet. SOUTH AFRICA - 1946 HIS JOB IS OUR FIGHT labelled 1/2d 'bantam' local cover. 1946 (23.I.) 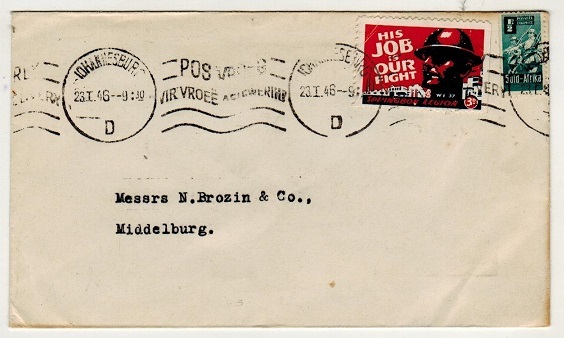 cover addressed locally to Middelburg bearing 1/2d reduced 'War Effort' adhesive tied in combination with dark blue and orange HIS JOB IS OUR FIGHT/SPRINGBOK LEGION patriotic label by JOHANNESBURG/D - POST EARLY slogan strike. SOUTH AFRICA - 1943 'RETURN TO SENDER' undelivered 1 1/2d rate censor cover. 1943 (JAN.11.) 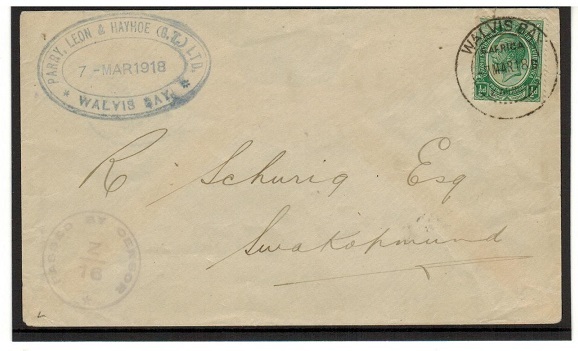 cover addressed to Durban bearing 'bantam' 1 1/2d tied PIETERMARITZBURG- POST EARLY roller strike. The cover was not delivered and struck by violet RETURN TO SENDER handstamp and boxed UNDELIVERED FOR REASON STATED/RETURN TO SENDER strike. The reason for non delivery being the addressee was military and had moved on. FPO/717 b/s and a range of military h/'s including NO TRACE RAF INDIA COMMAND. Interesting cover. Red bilingual OPENED/BY/CENSOR label at right. SOUTH AFRICA - 1913 use of Transvaal 4d RPSE to Cape used at BURGHERSDORP. H&G 4a. 1913 (NO.15.) 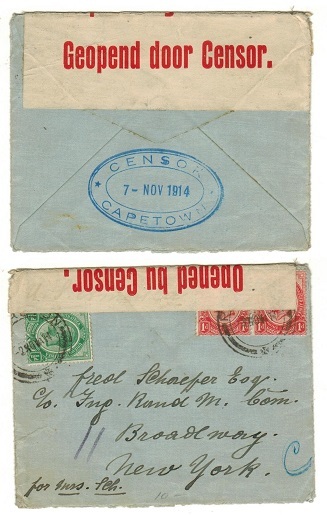 use of Transvaal 4d blue on cream registered postal stationery envelope (size G) addressed to Aliwal North in the Cape (H&G 4a) tied by 'skeleton' type BURGHERSDORP cds. 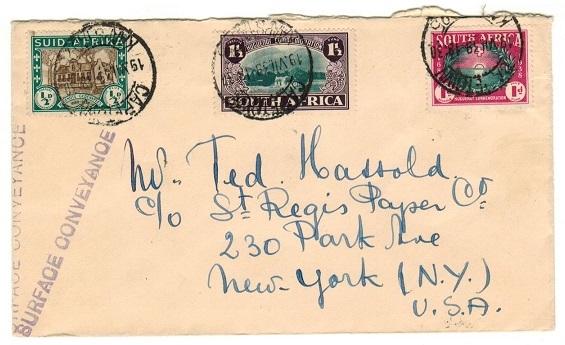 SOUTH AFRICA - 1952 'INSUFFICIENTLY PREPAID FOR AIRMAIL' cover to USA. 1952 (31.X.) 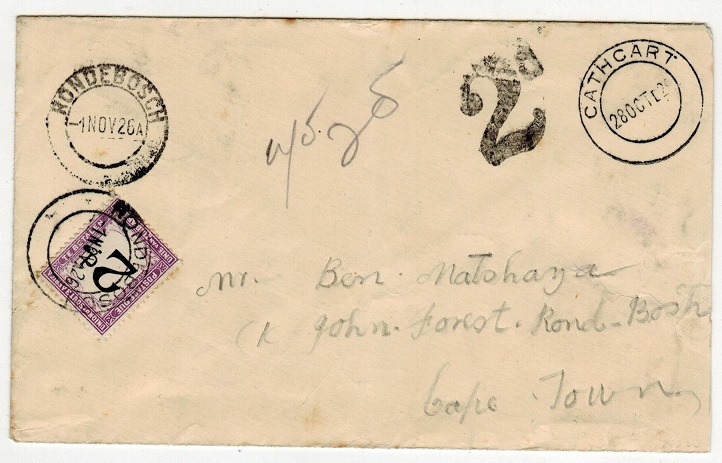 cover addressed to USA bearing 1/2d and 2d pair tied JOHANNESBURG/1141 and struck by bilingual INSUFFICIENTLY PREPAID/FOR AIRMAIL h/s in violet. SOUTH AFRICA - 1941 1 1/2d rate cover to UK with 1d/HOME COMFORT patriotic label. 1941 (29.XI.) 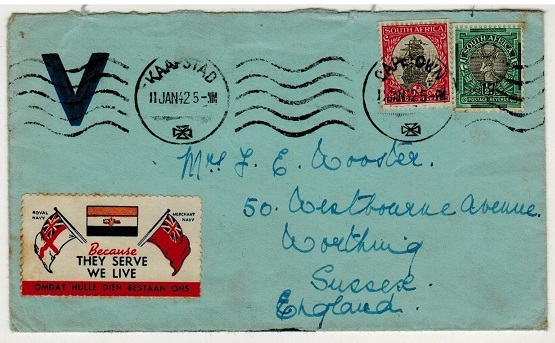 cover addressed to UK (a few light surface creases) bearing 1/2d and 1d adhesives tied in combination with red, white and blue perforated 1d/ISSUED BY/HOME COMFORTS/CITY HALL/ JOHANNESBURG patriotic label by JOHANNESBURG roller strike. SOUTH AFRICA - 1942 1 1/2d rate cover to UK with WE REALISE IN EAST LONDON patriotic label applied. 1942 (OKT.21.) cover addressed to UK then re-directed bearing 1 1/2d adhesive tied by EAST LONDON/SPEND LESS roller strike and with red, white and blue perforated WE REALISE IN/EAST LONDON/THE SAFE ARRIVAL/OF THIS LETTER/IS DUE TO/THE BRITISH NAVY patriotic label tied by LONDON arrival cancel. A scarce label of this series only being used at East London. SOUTH AFRICA - 1941 1 1/2d rate cover to UK with 'V' for victory 'S.A.W.A.S.' label. 1941 (13.XI.) 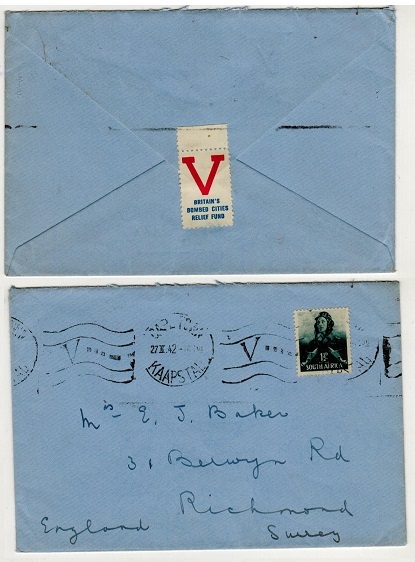 cover addressed to UK (roughly opened at left) bearing 1/2d (x3) adhesives tied by DURBAN roller strike and bearing red,white and blue 'V/SAWAS' (V for Victory) label at lower left. 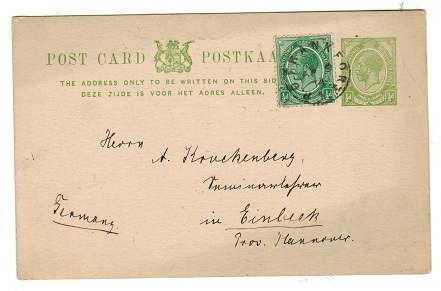 SOUTH AFRICA - 1916 1d rate postcard use to Sweden with PASSED/41/CENSOR h/s applied. 1916 (AUG.28.) 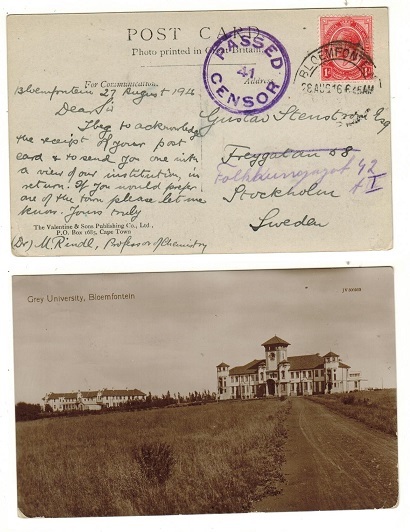 use of picture postcard addressed to Sweden depicting 'Grey University-Bloemfontein' bearing 1d adhesive tied BLOEMFONTEIN and struck at left by violet circular PASSED/41/CENSOR handstamp. 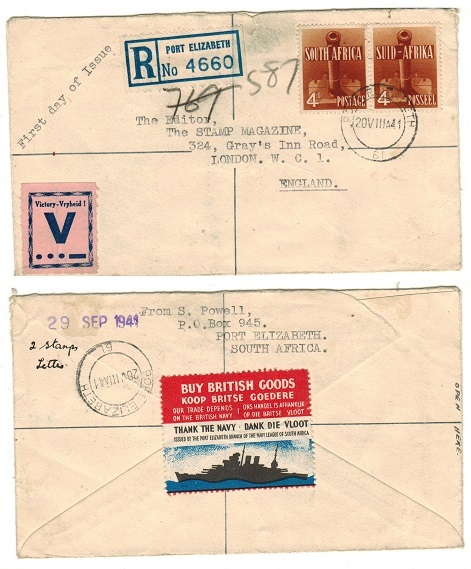 SOUTH AFRICA - Range of 7 'War Effort' covers to UK. 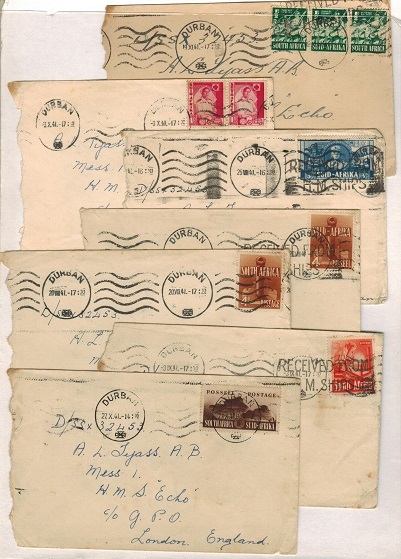 1941 range of seven covers bearing various 'War Effort' adhesives (all roughly opened at edge) and each used at DURBAN. 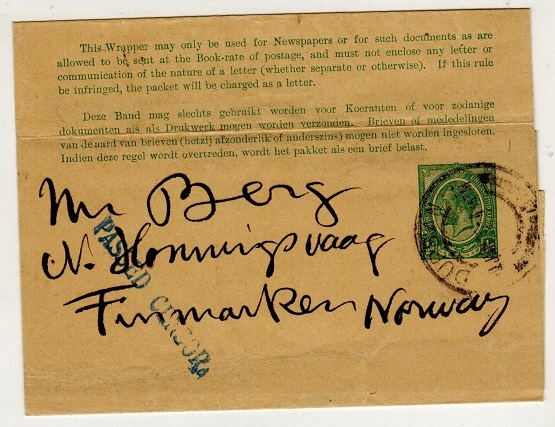 SOUTH AFRICA - 1913 1/2d green PASSED CENSOR postal stationery wrapper to Norway. H&G 1. 1913 1/2d green on buff postal stationery wrapper addressed to Norway (scarce) cancelled DURBAN and dated 9.JUN.16 with blue straight lined PASSED CENSOR handstamp applied. A scarce censoring of a newspaper wrapper. H&G 1. 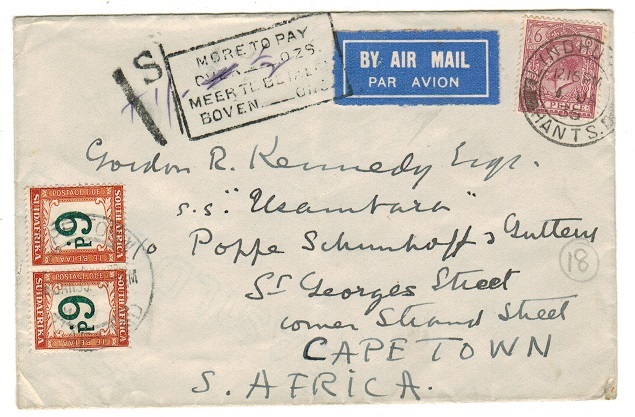 SOUTH AFRICA - 1946 1/2d 'bantam' cover to Johannesburg with THIS IS IMPORTANT label. 1946 (9.I.) 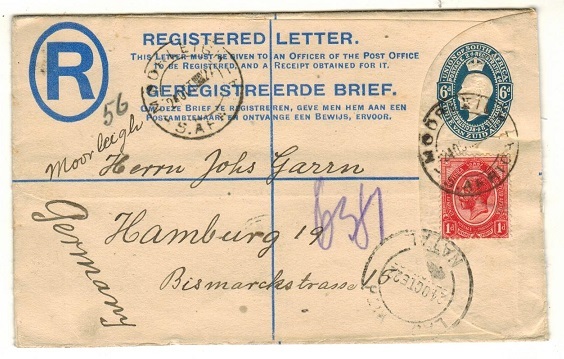 long cover addressed to USA bearing 'bantam' 1/2d adhesive tied by JOHANNESBURG/POST EARLY roller strike which in turn ties a red on cream THIS IS IMPORTANT label at left. AUSTRALIA (South Australia) - 1855 'PAID/ADELAIDE' commercial entire used locally. 1855 (SP.11.) pre-printed 'Bank Of Australia' entire addressed locally and cancelled by PAID/ADELAIDE S.A. handstamp in red. 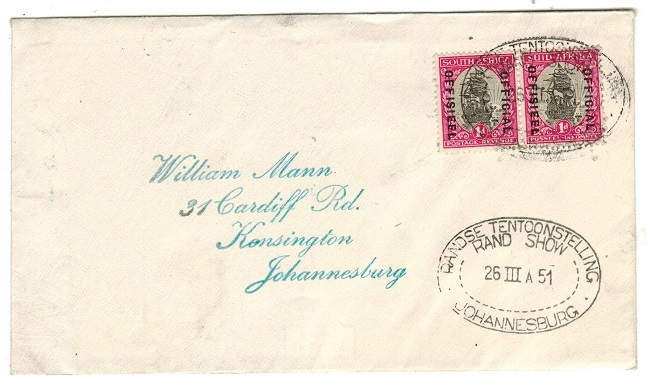 SOUTH AFRICA - 1951 'RAND SHOW JOHANNESBURG' cover. 1951 (26.III.) cover addressed locally bearing a fine bilingual 1d 'ship' pair overprinted OFFICIAL tied by special oval RAND SHOW/JOHANNESBURG cancel. SOUTH AFRICA - 1934 'ROYAL TOUR/H.R.H.PRINCE GEORGE' cover to Pretoria. 1934 (16.III.) 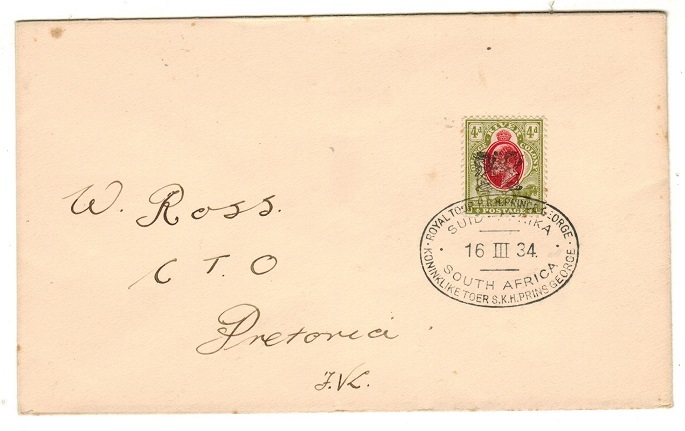 cover addressed to Pretoria bearing Orange River Colony 4d adhesuve tied by special crowned oval ROYAL TOUR H.R.H. PRINCE GEORGE bilingual h/s. SOUTH AFRICA - 1917 censored 'Prisoner Of War' cover to Switzerland. 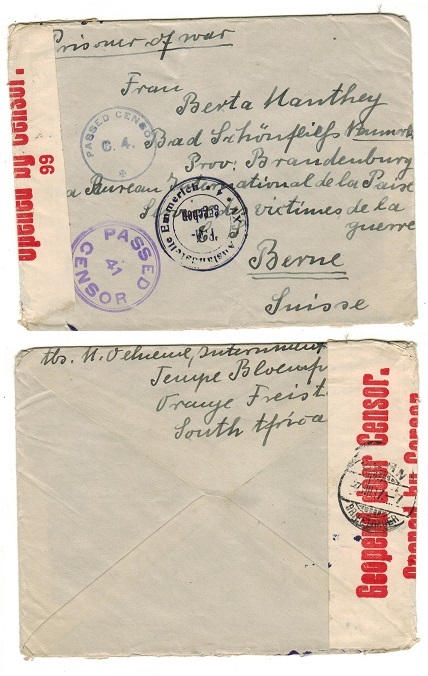 1917 cover addressed to the Red Cross in Switzerland from an inmate at the Prisoner Of War Camp in Bloemfontein with red on cream bilingual OPENED BY CENSOR/99 label at left abd struck by both violet circular PASSED/41/CENSOR and PASSED BY CENSOR/C.4. handstamp. SOUTH AFRICA - 1917 (circa) censored 'Prisoner Of War' cover to Switzerland. 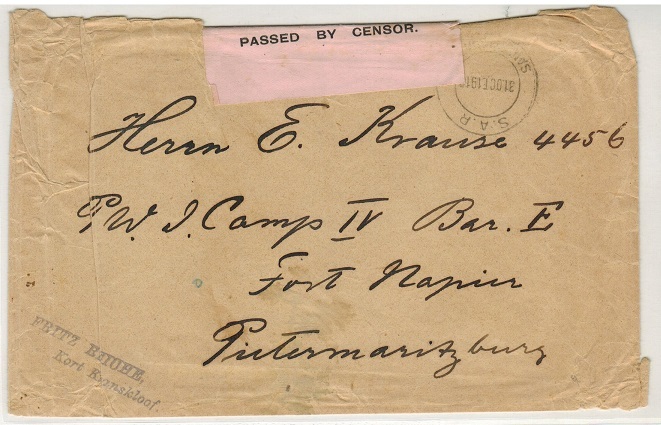 1917 (circa) 'mourning' cover addressed to the Red Cross in Switzerland from an inmate at the Prisoner Of War Camp in Bloemfontein with red on cream bilingual OPENED BY CENSOR/ 99 label at lower edge and struck by both violet circular PASSED/41/CENSOR and PASSED BY CENSOR/ C.4. handstamps. SOUTH AFRICA - 1925 2d rate cover to UK used at BURGHERSDORP. 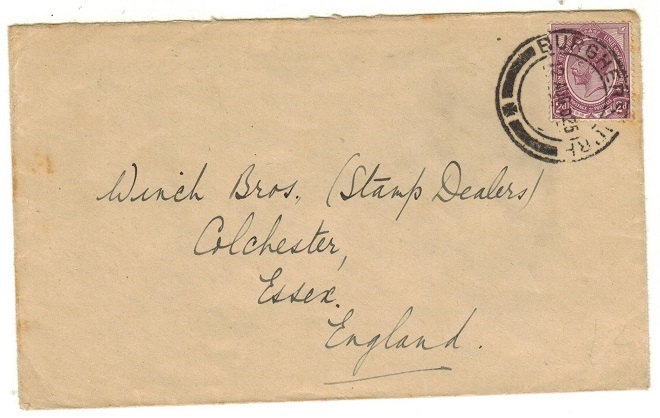 1925 (AUG.12) cover to UK bearing 2d adhesive tied by BURGHERSDORP cds. SOUTH AFRICA - 1925 6d rare registered cover to UK used at KEI ROAD. 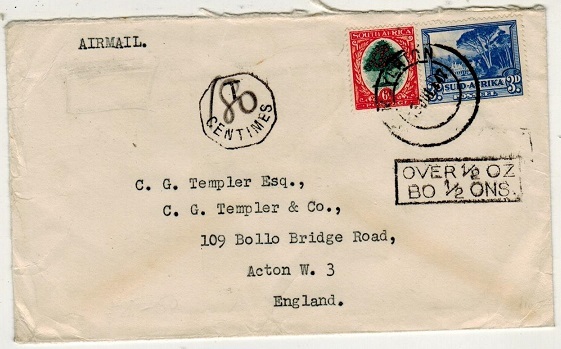 1925 (Mar.20) registered cover addressed to UK bearing 6d tied KEI ROAD cds with 'R' alongside with ms. etiquette. A rare strike. SOUTH AFRICA - 1922 3d rate cover to Germany used at TABASE. 1922 (NO.2.) cover addressed to Germany (light vertical fold) marked 'Via England' bearing 1d and 2d 'head' adhesives tied by TABASE/C.G.H. cds. A scarcer Trankei strike. SOUTH AFRICA - 1941 3d rate cover to USA with 'V/BRITAIN BOMBED CITIES' patriotic label applied. 1941 (15.XI.) 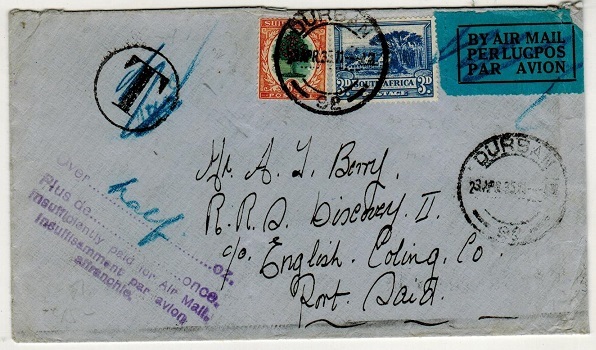 cover addressed to USA bearing 1d strip of three tied by CAPETOWN bilingual roller strike and with red, white and blue perforated 'V/BRITAINS/BOMBED CITIES/RELIEF FUND patriotic label at lower left. Sent by surface mail. SOUTH AFRICA - 1941 8d registered cover to UK with 'V for VICTORY' and 'BUY BRITISH' labels applied. 1941 (20.VIII.) registered cover addressed to UK bearing a fine pair of the 4d adhesive tied by PORT ELIZABETH/61 cds sent on the first day of issue of these stamps and with scarce dark blue on pink rouletted VICTORY-VRYHEID/ V/… - (morse) patriotic label on front and a fine perforated example of the red, black and blue on white BUY BRITISH GOODS/THANK THE NAVY bilingual label on reverse flap. SOUTH AFRICA - 1918 'MAKE YOU SIXPENCE FLY' aerial first flight postcard to Observatory. 1918 (OCT.7.) 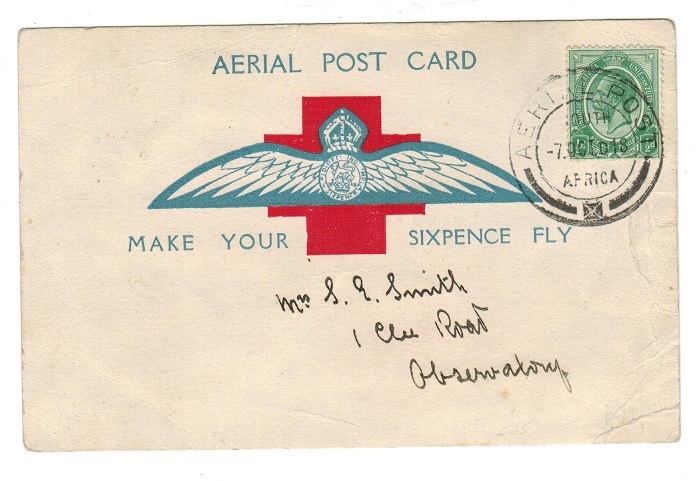 AERIAL POST CARD addressed locally to Observatory with 'crested flying wings' MAKE YOUR SIXPENCE FLY inscription bearing 1/2d green 'head' adhesive tied by AERIAL POST/SOUTH AFRICA cds. Some edge crumpling at right but a scarce first flight card with small message reading 'The war will soon be over'. SOUTH AFRICA - 1918 AERIAL POST CARD 'Make Your Sixpence Fly' first flight card to Cape Town. 1918 (NOV.22.) 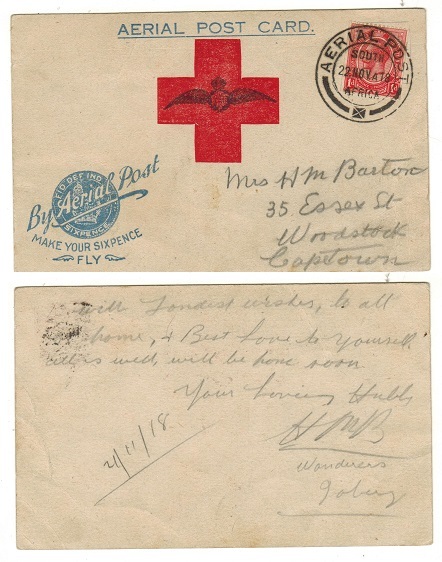 'Red Cross' AERIAL POST CARD addressed to Cape Town cancelled by AERIAL POST cds. A scarce RAF 'Make Your Sixpence Fly' flight card. 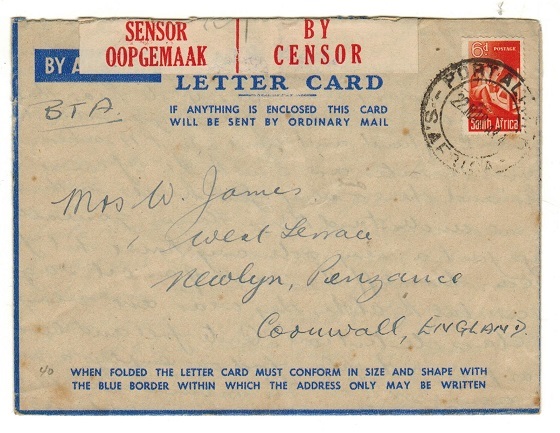 SOUTH AFRICA - 1944 censored LETTER CARD to UK used at PORT ALICE. 1944 (MAR.22.) use of FORMULA blue on buff postal stationery letter card addressed to UK bearing 6d 'bantam' adhesive tied PORT ALICE/S.AFRICA with red on cream bilingual OPENED/BY/CENSOR label at top edge tied by crested 'C' censor applied at Durban. 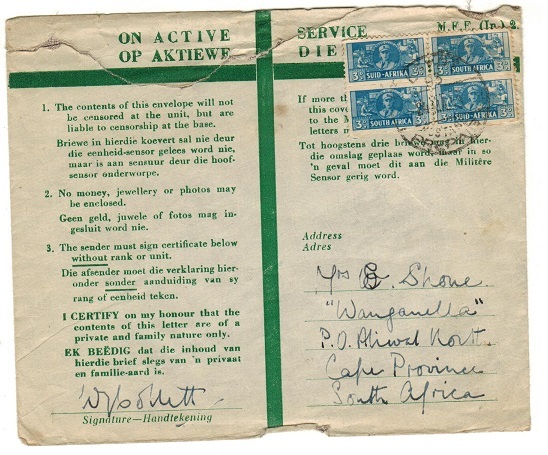 SOUTH AFRICA - 1942 inward censored 'ACTIVE SERVICE' green cross envelope to Johannesburg. 1942 (circa) inward (A.F.W3078) ACTIVE SERVICE green cross envelope bearing GB 1/2d (x5) and 2 1/2d (x3) adhesives tied by indistinct cds with crowned PASSED BY CENSOR h/s at lower left. 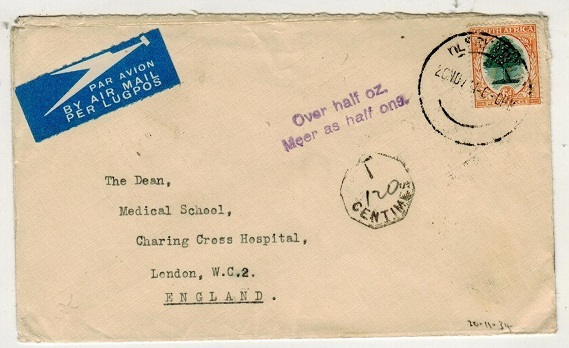 SOUTH AFRICA - 1941 'ON ACTIVE SERVICE' green cross envelope used at EGYPT/34 to Durban. 1941 (NO.12.) inward (M.F.F.In.2) ON ACTIVE SERVICE green cross envelope bearing 4d and 6d adhesives tied by EGYPT/34/PRE PAID cancel. 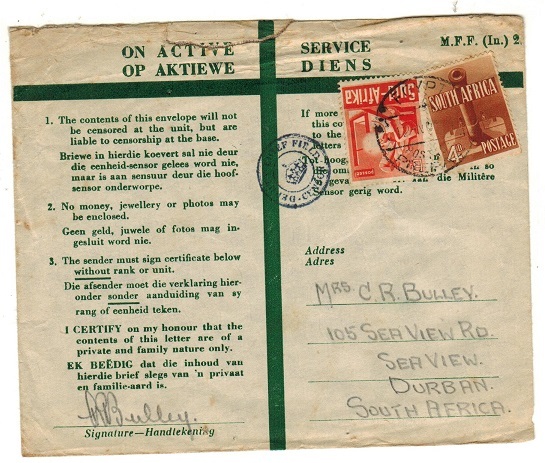 SOUTH AFRICA - 1943 'ON ACTIVE SERVICE' green cross envelope used at EGYPT/93 to South Africa. 1943 (MA.24.) use of (M.E.F. 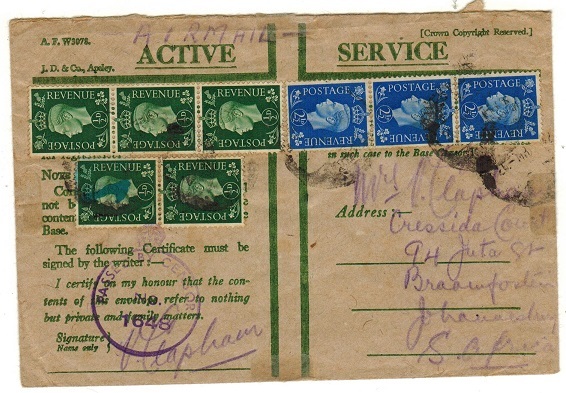 In.2) ON ACTIVE SERVICE green cross envelope addressed to South Africa bearing 3d 'bantam' block of four cancelled by EGYPT/93/PRE PAID cancel. SOUTH AFRICA - 1926 4d (x60) official stamp envelope (no stamps). 1926 4d black on buff official stamp envelope with original red wax seal on reverse side pre- printed '60/4d/POSSEEL'. This envelope originally contained 60 copies of the 4d grey-blue 'triangle' (SG 33) adhesive and was issued to the Post Offices in this form. Very scarce. SOUTH AFRICA - 1918 'PASSED BY CENSOR' S.A.R.SANDYMOUNT 961 local railway cover. 1918 (OCT.31.) 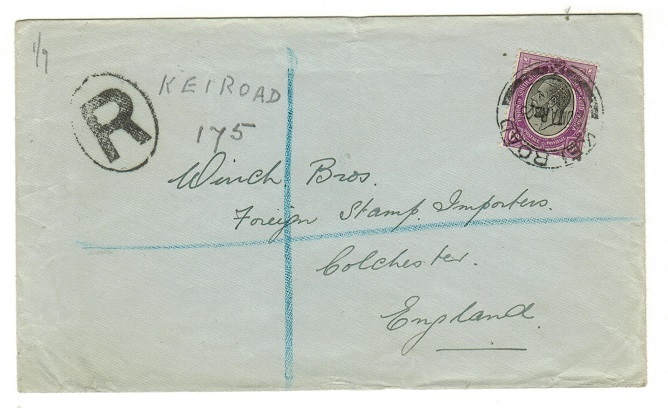 stampless cover (edge creasing) addressed locally to Pietermaritzburg cancelled by S.A.R.SANDYMOUNT 961 cds (South African Railways) with scarce black on pink PASSED BY CENSOR label at top edge. SOUTH AFRICA - 1934 'ROYAL TOUR' cover to Pretoria. 1934 (16.III.) 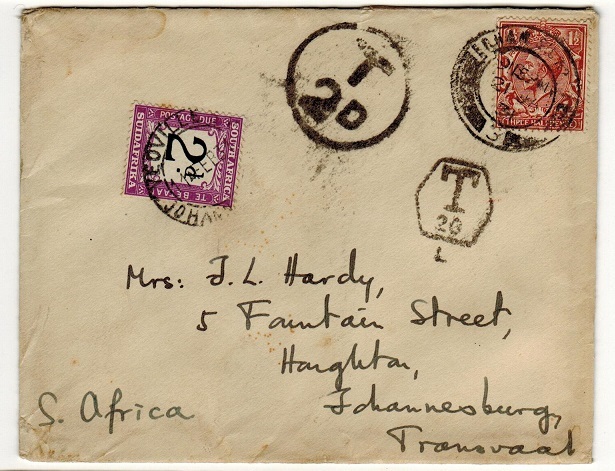 cover addressed to Pretoria bearing 3d blue 'head' adhesive marginal block of four struck by bilingual SOUTH AFRICA/ROYAL TOUR handstamp in black with PRETORIA arrival b/s. SOUTH AFRICA - 1913 1/2d yellow green PSC to Germany uprated and used at P.O.FRANKFORT. H&G 1. 1913 1/2d yellow green on cream postal stationery postcard addressed to Germany cancelled by scarce s/r P.O.FRANKFORT cds dated AP.9.14. H&G 1. 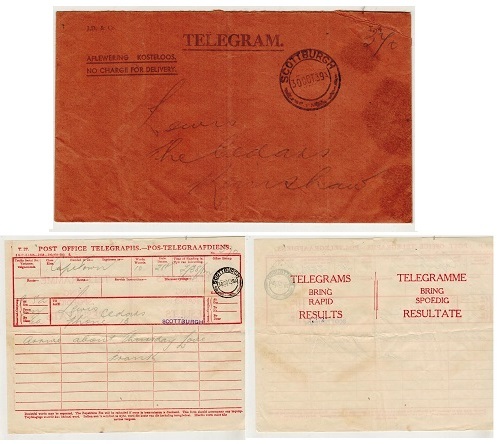 SOUTH AFRICA - 1937 TELEGRAM envelope used at DOORNFONTEIN. 1937 (NO.8.) 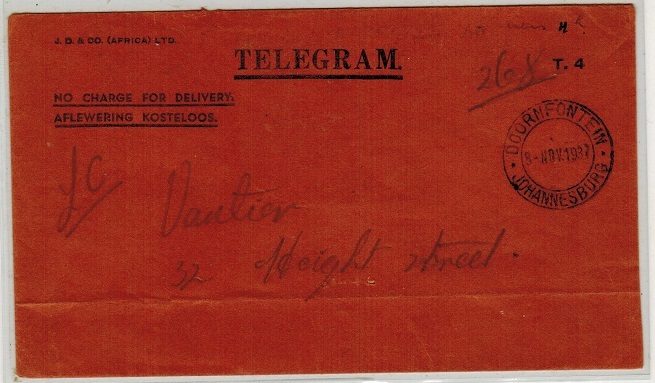 black on bright salmon TELEGRAM envelope addressed locally and cancelled by DOORMFONTEIN/JOHANNESBURG cds. 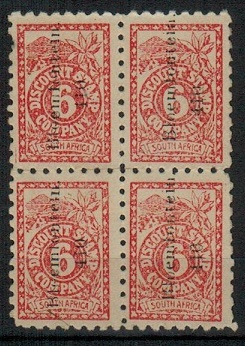 SOUTH AFRICA - 1920 (circa) 6d red 'DISCOUNT STAMP' in a mint block of four. 1920 (circa) red on white perforated 6d DISCOUNT STAMP/COMPANY adhesive in a fine block of four overprinted BLOEMFONTEIN/410 sideways in black. Some original gum but with a hint of the stamps having stuck to backing paper. Minor faults but a scarce block. SOUTH AFRICA - 1923 1d rate postcard use to Transvaal used at PARIJS. 1923 (MAR.7.) 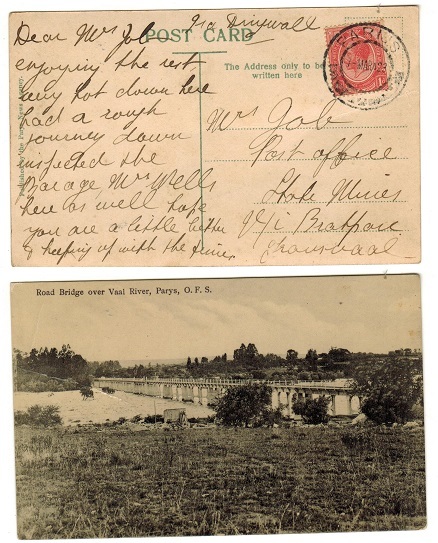 use of picture postcard addressed to Transvaal depicting 'Road Bridge over Vaal River, Parys in OFS' bearing 1d 'head' adhesive tied by PARIJS cds. A late use of this cancel. SOUTH AFRICA - 1936 'EMPIRE EXHIBITION' cover to Edenville. 1936 (15.IX.) 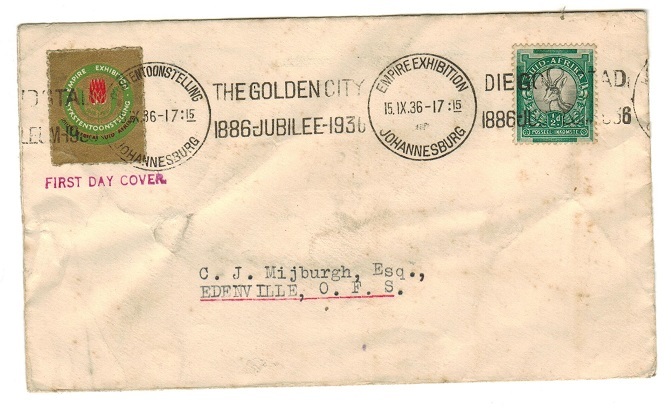 cover addressed locally to Edenville in the former OFS (a little grubby) bearing 1/2d 'springbok' adhesive tied in combination with red and green on gold EMPIRE EXHIBITION label by EXPIRE EXHIBITION JOHANNESBURG roller strike. Marked 'First Day'. 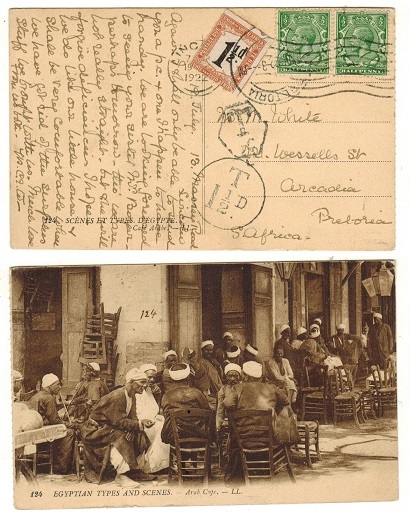 SOUTH AFRICA - 1916 unpaid postcard with UNSTAMPED h/s and 1d 'Postage Due' added. 1916 (JAN.7.) 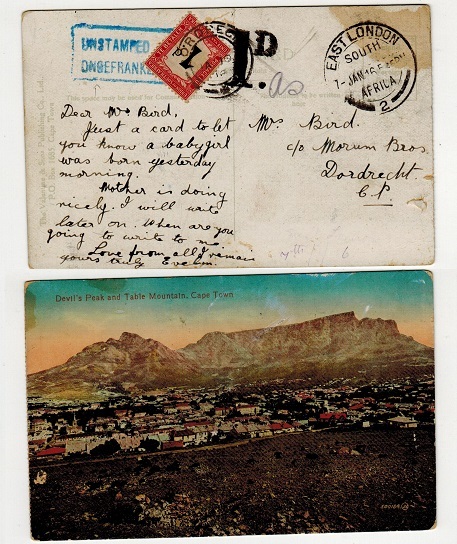 use of unstamped picture postcard addressed locally depicting 'Devils Peak and Table Mountain' cancelled by EAST LONDON/SOUTH/AFRICA/2 cds and struck by large '1d' tax mark in black with scarce bilingual boxed UNSTAMPED handstamp in blue with 1d 'Post due' adhesive added (SG D2) tied by DORDRECHT cds three days later. SOUTH AFRICA - 1916 'S.A. Overseas Expeditionary Force' RECEIVED FROM H.M.SHIP cover to UK. 1916 (JAN.14.) stampless cover addressed to UK marked 'South African Overseas Expeditionary Force' in manuscript and struck by black boxed RECEIVED FROM H.M.SHIP/NO CHARGE TO BE RAISED h/s and with LONDON arrival. 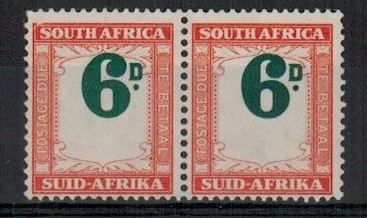 SOUTH AFRICA - 1918 4d RPSE used at SPRINGS underpaid with 2d 'Postage Due' pair added. 1918 4d blue on cream registered postal stationery envelope (H&G 2a) addressed to Cape Town and bearing 1d 'ship' on front and 4d 'air' on reverse side cancelled by SPRINGS cds dated 29.AUG.29. The cover was under paid and received a 2d 'Postage Due' pair on arrival and cancelled by CAPETOWN/CAAPSTAD 2 cds. SOUTH AFRICA - 1946 6d REVENUE pair U/M with language error. 1946 6d blue and orange 'REVENUE' vertical unmounted mint bilingual adhesive pair showing the error REVENUE TRANSPOSED. (English on Afrikaans issue and IKOMSTE on English version). A scarcer language error. SOUTH AFRICA - 1948 3d rate 'BRITISH CENSORSHIP 5090' cover to Germany. 1948 (28.I.) 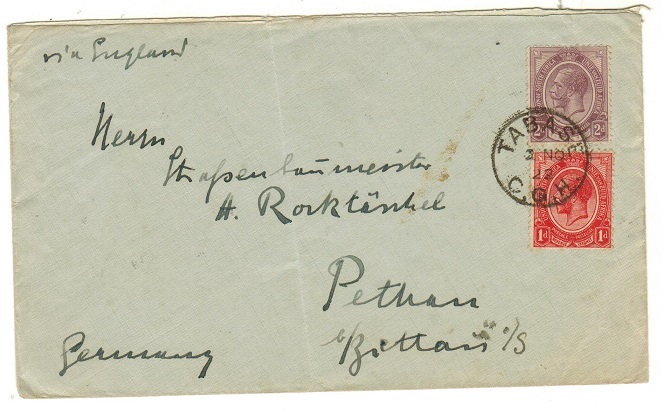 cover addressed to Germany bearing 3d single adhesive tied KNTSNA with black on cream crowned continuous OPENED BY/EXAMINER censor label at left tied on the front by violet circular BRITISH CENSORSHIP/GERMANY/5090 strike. 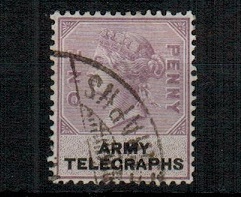 SOUTH AFRICA - 1899 1d lilac and black 'ARMY/TELEGRAPHS' used. SG AT3. 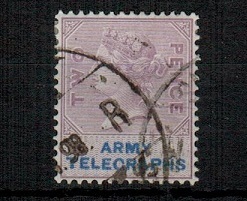 1899 1d lilac and black 'un-appropriated die' issue with ARMY/TELEGRAPHS in tablet in fine used condition. Used during the Boer War. SG AT3. SOUTH AFRICA - 1899 2d lilac and blue 'ARMY/TELEGRAPHS' used. SG AT4. 1899 2d lilac and blue 'un-appropriated die' issue with ARMY/TELEGRAPHS in tablet in fine used condition. Used during the Boer War. SG AT4. SOUTH AFRICA - 1946 cover to Germany with 'MILITARY CENSOR/CIVIL MAILS' h/s applied. 1946 (4.V.) 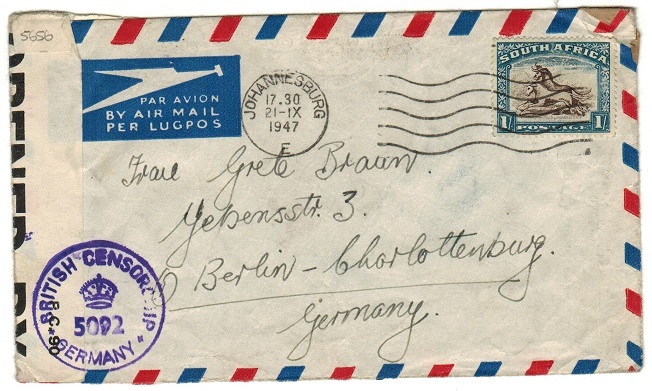 cover addressed to Germany bearing 3d and 1/- 'bantam' adhesives tied by CAPE TOWN/ POST EARLY slogan strike and with OPENED BY/MIL.CEN. CIVIL MAILS censor label at left with PSS.2411. 8.45.2000M imprint tied on the front by violet circulat MILITARY CENSORSHIP/20011/CIVIL MAILS h/s. 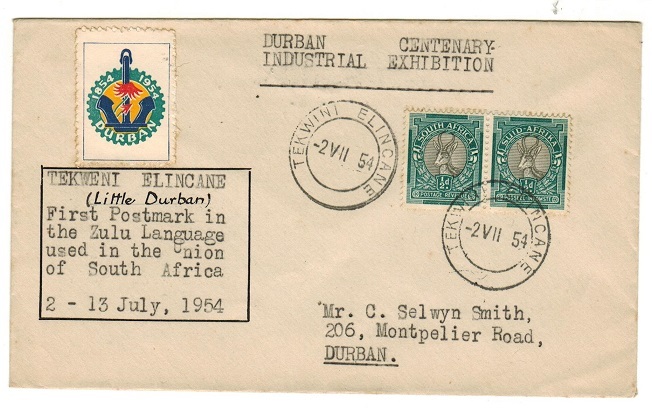 SOUTH AFRICA - 1954 1d rate (Exhibition) TEKWINI ELICANE local cover with label. 1954 (2.VII.) cover endorsed 'Durban Centenary/Industrial exhibition' addressed locally and bearing 1/2d 'springbok' pair tied by special TEKWINI ELINCANE fair cancel in Zulu language and with multi coloured 1854-1953 DURBAN commenoration perfortade label applied. 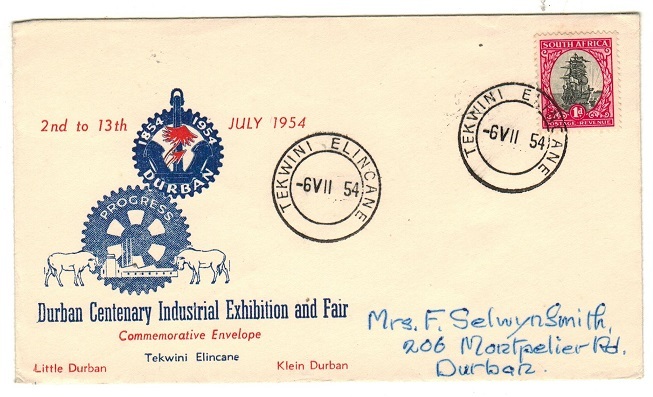 SOUTRH AFRICA - 1954 1d rate (Exhibition) TEKWINI ELINCANE local cover. 1954 (6.VII.) illustrated 'Durban Centenary Industrial Exhibition and Fair' cover addressed locally bearing 1d 'ship' tied by special TEKWINI ELINCANE fair cancel in the Zulu language. SOUTH AFRICA - 1947 'BRITISH CENSORSHIP/GERMANY' cover to Germany used at JOHANNESBURG. 1947 (21.IX.) 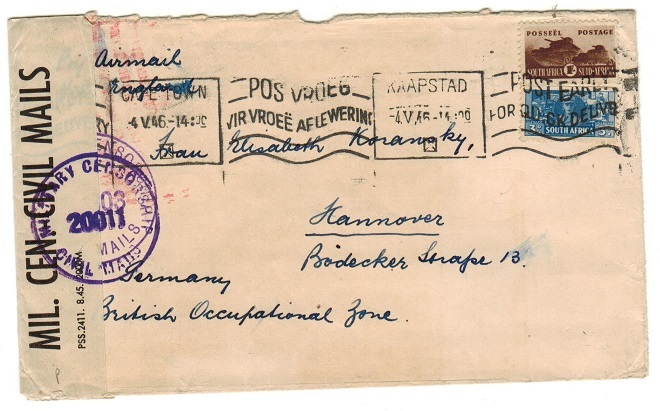 cover addressed to Germany bearing 1/- adhesive tied by JOHANNESBURG roller strike with black on white OPENED BY/EXAMINER 605 censor label at left tied on the front by violet crowned BRITISH CENSORSHIP/5092/GERMANY. A nice censored cover after WWII. 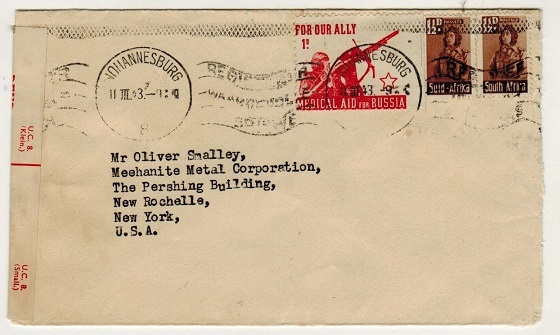 SOUTH AFRICA - 1946 'US CIVIL CENSORSHIP/GERMANY' cover to Germany used at JOHANNESBURG. 1946 (16.VIII.) 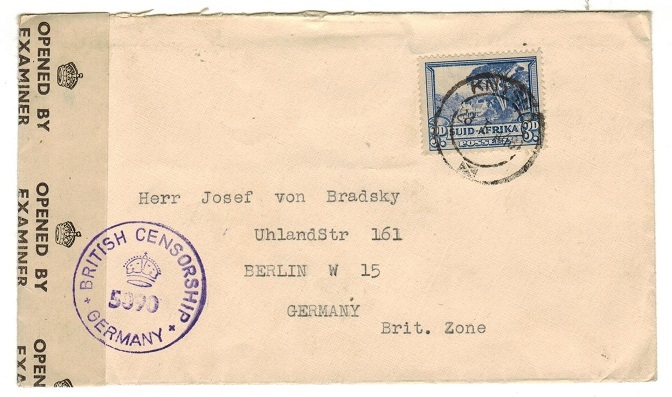 cover addressed to Germany bearing 3d adhesive tied by JOHANNESBURG/SAVE MEAL AND BREAD slogan strike with clear OPENED BY/MIL.CEN-CIVIL MAILS censor label at left tied on the front by blue crested US CIVIL CENSORSHIP/PASSED 30144/GERMANY handstamp. Interesting censored mail after WWII.